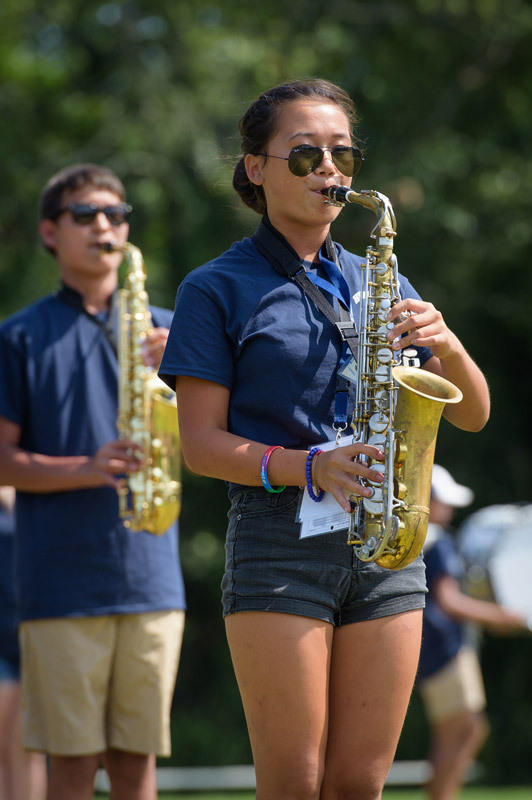 Huntington High School’s Blue Devil marching band emerged from its annual intensive camp stronger than ever and ready to entertain crowds and go toe-to-toe with the best bands in the state in a series of competitions. A mini-camp was followed by a weeklong, full-day camp that was held at J. Taylor Finley Middle School. 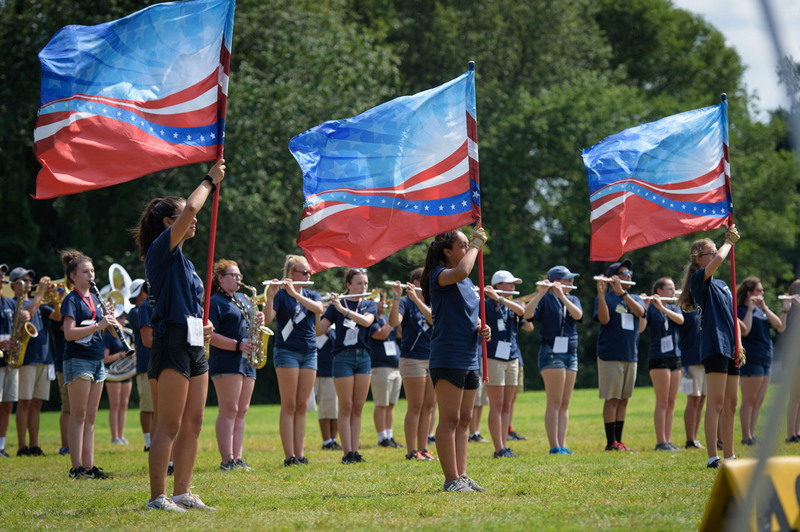 Musicians and color guard members worked hard to master this year’s field show, The Power Within. The results are impressive. The band put on a Sunday show for parents and family members, which was well received by everyone, including district officials who turned out for the afternoon event. The setting at Finley proved ideal for the band to work on nailing down this year’s show. The group had the building and fields to itself. Absent distractions, the musicians and color guard members made rapid progress. Katie Riley, Mathew Hearl and Jennifer Low are the Blue Devils’ drum majors. James Obermaier is the field major. This year’s show is called The Power Within. The Blue Devils will march in a pair of parades this fall, perform at halftime of several home varsity football games and compete in a string of regional shows before trekking to Syracuse for the state championships. Patrick Neary is the band’s co-director. Rich Guillen is the music arranger. Jason Giachetti is handling percussion arrangements and the battery and pit designs. George Nelson is in charge of drill design. Mallory Martilla and Patrick Neary are handling the color guard design. The battery instructors are Sudwip Debnath, Derek Schmelter and Jarod Sullivan. Chris Wink is the brass instructor. Mallory Martilla is the color guard’s instructor. Corina Antonucci and Sean Lucas are pit instructors. Sudwip Debnath, Dan DeOliveira and Jarod Sullivan are visual instructors. Katherine Adams is the band’s woodwind instructor. Brian Stellato is also serving as an instructor as well as the band’s coordinator. The competitive season will commence on Sunday, September 16 at Brentwood and continue with showdowns at Copiague (Sunday, September 23), Malverne (Saturday, September 29), Walt Whitman (Saturday, October 6), Arlington (Sunday, October 7), Sachem (Sunday, October 14) and Mineola (Saturday, October 20). The state championships are slated for Saturday-Sunday, October 27-28 in Syracuse. The band will march in the Huntington Station Parade on Saturday, September 22 and again in the Homecoming Day Parade on Saturday, October 20. The band will perform at halftime of varsity football games on the following Saturdays: September 22, September 29 and October 20. More than eight decades after its founding, the Blue Devil band is still going strong. The late summer camp has set the stage for what everyone hopes will be a very special season.